Well, now I know which of my unidentified Hibscus rosa-sinensis plants received the hard pruning described in my post of January 8. It was the yellow-flowered one. 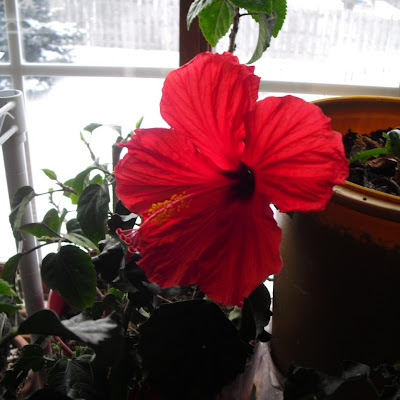 I know this because the red flowered one bloomed today! Now, if I'm smart, I'll put a label in the plants so I'll know what's what from now on. 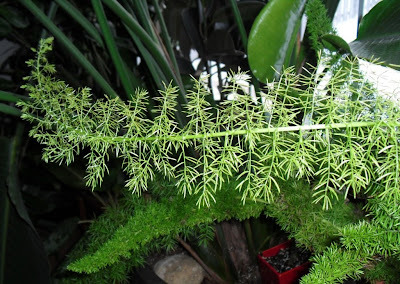 Foxy, my rather brutally pruned Asparagus meyersii, has put out another new "frond." I think I'll declare this experiment a success. This new branch has a fairly loose growth habit, due to the fairly weak winter sunlight. I think that it is pretty, anyway. 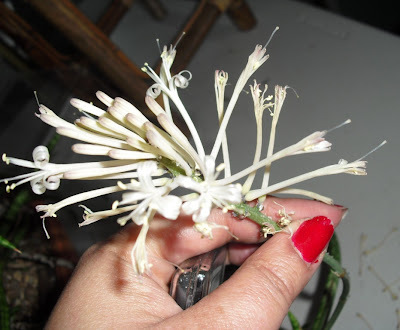 I wrote on January 27 that I would post a picture of my Sansevieria gracilis/ballyii/whatever flowers when the buds opened. Well, some of them opened and closed and fell off before I remembered to take a picture, but here is the bloom stalk with at least some open flowers. 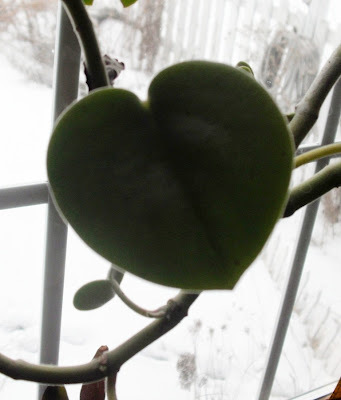 Finally, yesterday, I said that I had decided not to post pictures of heart-shaped leaves for Valentine's Day. 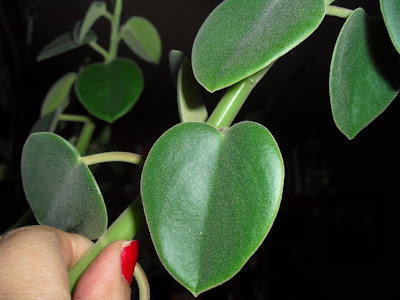 But I like these pictures of Peperomia incana, so I decided not to let them go to waste. 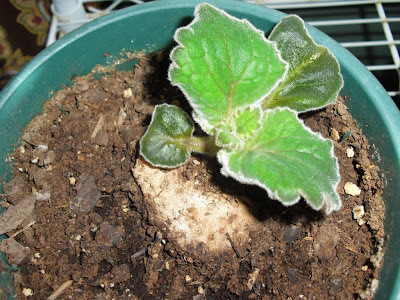 ...and here, showing the fuzzy texture of the leaves. Those Sans flowers are so amazing! I wish I remembered to bring in those Asparagus ferns at the end of the season. I always just toss them and see that many others do too. Maybe I'll just prune them back like you did to conserve some space. MrBrownThumb: They can be touchy indoors, more so if they were previously acclimated to the outdoors. If they get too warm or too dry, they will drop a lot of needles.